After releasing the ARCore SDK last year and testing it on the Pixel 2 phones, Google made the announcement official at MWC this year and expanded support for the first-gen Pixels, Galaxy S7/S7 Edge/S8/S8+, LG V30/V30+, ASUS Zenfone AR, and OnePlus 5, with more devices to be added in the future. Following that, we knew that the apps would start coming in but the past few days have seen several trickle down: Google's Just A Line experiment, eBay's shipping box size chooser, and IKEA's furniture visualizer, were just a few. Turns out there is more. How much more? A total of 86 Android apps have added some ARCore element at the time of writing. 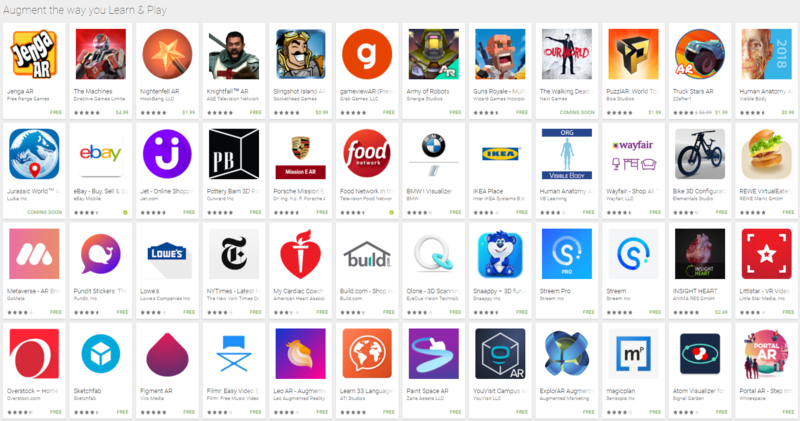 Google has a handy list you can check (the link may not be available depending on where you live), where you'll see a mishmash of games and apps. The focus in the latter appears to be on design and furniture shopping, like Overstock, Pottery Barn, and Wayfair, but there are other interesting uses. Scope AR's Remote AR lets you get remote technical assistance and explanations with real-time AR annotations, Food Network has a virtual bakery, My Cardiac Coach lets you perform CPR in AR, Insight Heart puts a giant living heart in front of you, Atom Visualizer brings chemistry to life, YouVisit Campus has college campuses available to virtually visit, AcoustiTools scans and diagnoses speaker issues in your setting, and of course there's an app with AR stickers. But there's really a lot more to explore here, so if you want to check them out, head over to the list on the Play Store and give them a go.